It's a quite community and nice neighborhood. This apartment has good amenities for children and it is close to lot of good stores and restaurants. It's school zone is very good. Great place for Kids. Good school near by. I am living here with my family last 4 years. Not bad for me. It is an old community, but living environment is good. So far so good, application processed Thursday, moved in Monday easily, no problems whatsoever, you guys are amazing and the apartment is beautiful! Great community with lots to do nearby. A very dog friendly area. The grounds are well maintained and overall is a very nice place to live. 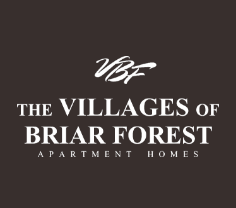 I just want to say I just adore my community it’s small, quiet and all my neighbors are so friendly here at The Villages of Briar Forest. I couldn’t have made a better choice I’m so glad I chose to move here. The community is good and is clean. The kids get to play in the park and they enjoy a lot. Waiting for the pool fun yet. We love the community. Thinking about leaving this year. Administration staff is not fair nor are they compassionate. They never complete tasks. It took a whole year to fix all the maintenance issues in my apt. And still all are nit fived. I really enjoy living at The Villages of Briar Forest Apartments because the have everything like a play ground and pool, i enjoy it because my son has fun there. This complex belongs to excellent BBE school.Staff here is amazing and helpful every time. Great place to live, nice locality and close by market places, schools and especially my work place. Many engaging and social events for residents. Very quiet, people mind their business. Nice neighbors so overall very nice place to stay at. Plus my apartment just got re done so it’s very pretty and exactly what I wanted! this is our third year and experience getting good , better... Staffs are doing a good job. Had some issue for one case but other than its going good. It is good, it got very noisy recently. The community is working hard to better provide security and better amenities to the residents. The front office engages residents well with all fun get-together. It is a good community to stay. Location is good and amenities are also good. All the apartments have upgraded equipment, ample space and storage facility. When I first applied to live at the apartment complex all staff were inviting and caring. Hospitality was amazing and smiles were on people’s faces. As we moved in and a few months past I quickly learned that two of the three staff were the caring individuals. My experience here has been the worst of all apartment complexes I have lived at. The communication. The roles. The maintenance. Everything is just off. The maintenance men are great but the process and length to get anything fixed is unbelievable. Great, friendly community situated near the energy corridor. Dog friendly apartments with well maintained grounds. Office staff are always super nice and helpful. I am hearing lot of incidents happening. Need more security. Kitchen was so dirty, appliances are so old and is so small. It would have have been so good if I got a pantry. Also washer and dryer were so old and not working properly. Model of the apartment is good. Good sunlight. From the start when we moved in here 2 years ago, I have to say that everything has been pretty pleasant. Of course with any place there are going to be some issues but everything works itself out. Hi Sofia! Thank you so much for taking the time to give us your feedback! We are so happy that you are enjoying your new home. If you decide that you want to get a pet just let us know, if it's a dog we have some enhancements coming very soon that you can take advantage of. If there is anything we can do for you in the future, please just let us know! Thanks, Rachel K. Business Manager.